Brand new 5 in 1 multi-functional heat press machine, the machine body is made of carbon steel possessing high intensity collision resistance. The high-quality stainless steel heating plate features high efficient in preserving heat. Updated insertion heating attachment installation provides express attachments change and better stability. 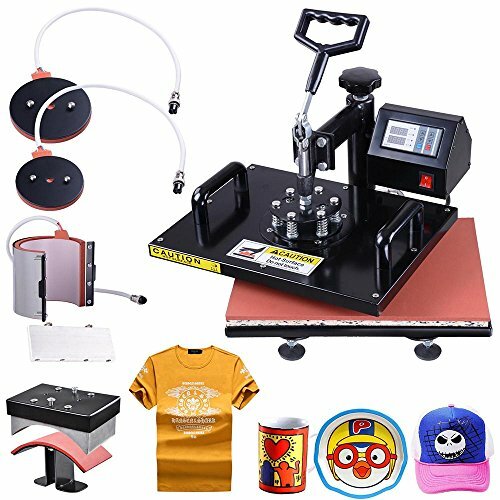 This all-in-one press can be used for T-shirts, caps, ceramic plates, ceramic tiles, mugs, coasters, mouse pads, jigsaw puzzles, lettering, other misc. fabrics & materials. Platen Press (telfon-coated) = 12" x 15"
Plate Press #1 = 4.92"
Plate Press #2 = 6.1"